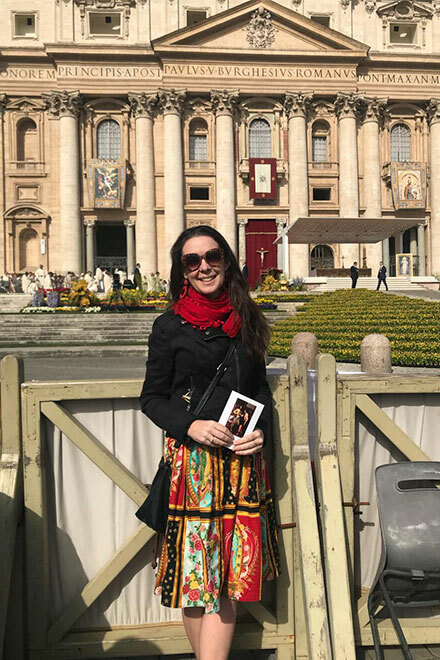 Brisbane Catholic woman and teacher Ora Duffley shares what it’s like to be in St Peter’s Square with thousands of pilgrims from around the world for the Divine Mercy Sunday Mass with Pope Francis. The Mass was celebrated in Rome overnight. A GLORIOUS morning dawned in Vatican City on April 8, the kind when one could not be anything but thankful for such a beautiful day. Each visitor to the eternal city that morning walked purposefully up the Via della Conciliazione and from all directions to gather together in St Peter’s Square. Beautiful flowers covered the piazza reminding us that we were in the season of Easter. Indeed, it was the last day of the octave and a Sunday beloved by many, Divine Mercy Sunday, exactly a week after we celebrated the Resurrection of Our Lord. The expectation was palpable as pilgrims converged in St Peter’s Square, each seeking vantage points for the Papal Mass, a highlight on the liturgical calendar. Pilgrims from everywhere converged together, taking photographs with friends and loved ones to remember the occasion. There were the young and the old, all breathing in the atmosphere of being present, at this place and at this moment in time. Millions of people look forward to and are profoundly moved by this feast day, a day in which we contemplate God’s love as He reaches down to meet our many needs and to ease the pain of His creatures. Each parish around the world celebrates this day but it is particularly special to celebrate it at our spiritual home in Rome. On arrival each pilgrim received a booklet for the Mass, Il Domenica di Pasqua and while waiting for Mass to begin, we prayed the Rosary together, honouring the mother of Divine Love, and the magnificent choir sang to the heavens. 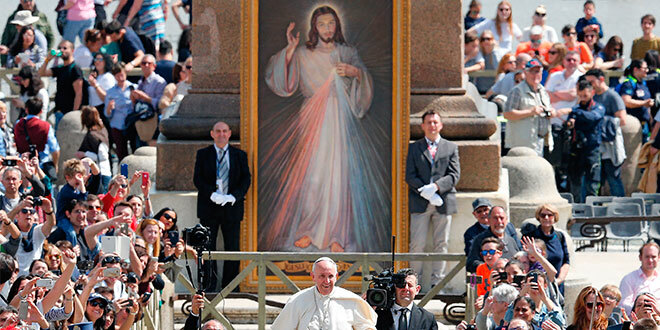 Displayed near the altar, for all to see was the image of Divine Mercy, given to St Faustina. Christ with one hand on his heart and the other one raised in a blessing, the healing rays emanating from His sacred heart, His mercy being poured out for us all and the reason all were gathered here. Divine Mercy Sunday was instituted by Pope St John Paul II and is especially important for our times; through contemplating it we receive a message of hope especially in our age as “in his wounds we contemplate the boundless love flowing from His heart” – a heart that beats for each person. The Divine Mercy is a devotion which is close to the hearts of so many because it is the story of pure love, as God looks down on his creatures with compassion, wishing to grant freedom from our limitations and inviting us all to realise true and eternal happiness. Through His sacrifice on the cross we see his intense love and longing for each individual. What a precious gift of faith to contemplate this truth. This devotion has ignited a fire of faith in so many hearts, which was clear to see by the thousands gathered together in St Peter’s Square with our Holy Father. How can the human heart not fail to be drawn and touched by the beauty of Jesus’ words? A Catholic girl, all the way from Australia, on the other side of the world, I happened upon a ticket for the Papal Mass from a Swiss Guard, on the night before, in front of St Peter’s Basilica. Love story: Brisbane Catholic laywoman Ora Duffley waiting outside St Peter’s Square for the Divine Mercy Sunday Mass with Pope Francis. Photo: Ora Duffley. Indeed, as a Catholic, there is nothing like the joyful feeling of coming home to Rome, our spiritual home, of seeing the dome of St Peter’s all the way from the Pont Sant Angelo. God works so quietly, mysteriously drawing us closer to Him in ways that we could never anticipate so that we can experience His infinite love and mercy; and he works through difficult and unexpected circumstances. And so, I found myself in Roma, on Divine Mercy Sunday. When I left to travel overseas a week ago, I never expected that I would be in Rome for this day, yet through God’s providence, there I was. Like the thousands of others present, He had brought me there, because, God never fails to meet the needs of our hearts. He guides our paths, and on this day, it was the path to Rome. Some may call it serendipity, or, as I like to say, a blessing of God’s grace. I believe that all who attend Holy Mass on this morning experienced special moments of pilgrimage and prayer. It is always wonderful to be present at Mass, and particularly in Rome, as part of the universal Catholic family gathered together to pray with our Holy Father. As I looked around at the other pilgrims present, I know that each individual was carrying in their hearts their own particular petitions and cares. As I met and chatted with people from all over the world, the morning revealed a powerful, common bond that unites us all, as little branches of the one tree, a shared understanding and experience of the Divine Mercy of our good God. At 10.30am Holy Mass began, the schola sang Misericordes sicut Pater. Compassionate Father. During the Mass there were solemn, reverent moments of stillness in adoration and thanksgiving at consecration on the altar when a quiet hush fell over St Peter’s Square despite the large numbers in attendance. Each one together in prayer during the Mass and at Holy Communion, we received Him, Him through whose wounds we are saved. It is always an amazing miracle! This message of God’s redeeming love and mercy touched the hearts of all present. It was amazing to be among so many there in the square and I spoke to families and young people from across the world – strangers with their own stories whilst at the same time unified by our Saviour. One could not fail to be touched by the spirit of Christian charity as we gathered together, that feeling of joy in the square. 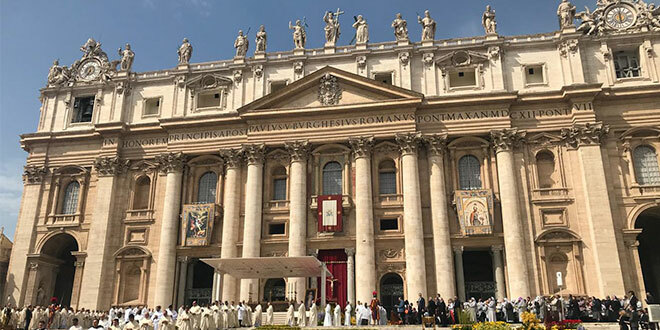 With the final blessing, the Mass ended and the Regina Coeli was sung, the bells of St Peter’s rang out accompanied by joyful music of the Easter season, but the Pope did not leave and neither did the crowd. He greeted the faithful who would not depart without greeting him back. To observe how different nationalities express their faith in God and their joy to see the Holy Father is always interesting – the young French militantly cheering for “Francois”, the Latinos exuberant as they clapped and greeted “Papa Francisco”, Asians more reserved, but equally joyful, for our Holy Father as he made his way, in the popemobile, through the gathered crowds. What was especially hopeful was to see so many young people present. How passionate our Catholic young people are about living their faith, their youthful spirit and energy on fire; this is the Church, the present and the future. Earlier in the morning, at the Papal Mass, Pope Francis had encouraged the faithful not to give up on the sacrament of Reconciliation. And so, later in the afternoon when I visited the Church of Santo Spirito in Sassia, just a few metres from St Peter’s Piazza, it was especially moving to see and to join the queues of people waiting in lines to receive the sacrament of Reconciliation, waiting in turn to unburden themselves of their sins, trusting in Jesus’ Divine Mercy through this life-giving sacrament, ministered by the many multi-lingual priests present. Lines of people queued for Confessions, the faith of ordinary people in the mercy of God, on this Sunday of Divine Mercy. A plenary indulgence is attached to this day. Inside the church stood a beautiful shrine and there hung many of the rosaries and mementoes as well as hundreds of candles lighting in front of an image of Jesus, little tokens of petition and thanksgiving for our Lord. So, what brought me to Rome on this day of Divine Mercy? He did. It is not a devotion I pray often; however, I know that, thanks to His gentle call in my heart, He has revealed an even deeper sense of His infinite love, and this devotion will be such an important part of my life going forth. It is so amazing how God helps us to grow on our journey of faith. As much as we put our confidence in Him and dwell with Him as we go about our daily lives, we are nourished and nurtured by His kind and loving heart. Jesus said to St Faustina, “I want you to be very little, because when you are little, I carry you close to My Heart. Because you are weak, I take you in My arms and carry you to the home of My Father.” Jesus, I trust in Thee. Blessed trip: Ora Duffley’s view from St Peter’s Square, Rome, on Divine Mercy Sunday. Photo: Supplied.